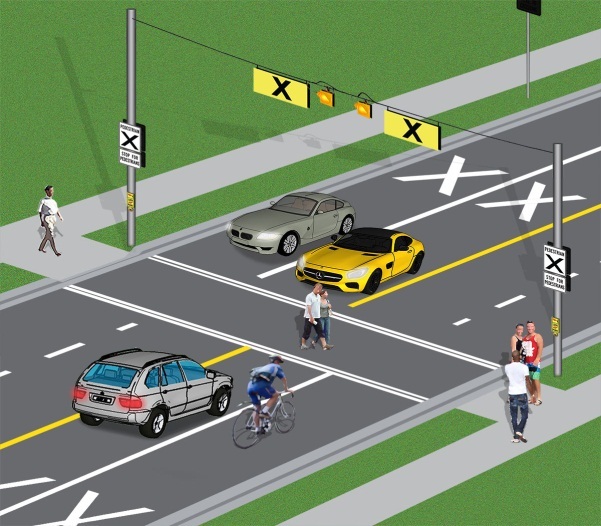 New rules at pedestrian crossovers and school crossings effective Jan 1, 2016. Drivers and cyclists must stop and yield the whole roadway at pedestrian crossovers; and at school crossings where there is a crossing guard displaying a school crossing stop sign. Only when pedestrians and school crossing guards are safely on the sidewalk, can drivers and cyclists proceed. This is part of Making Ontario’s Roads Safer Act. New Pedestrian Crossing Safety Rules apply at pedestrian crossovers identified with specific signs, road markings and lights – the new rules do not apply to pedestrian crosswalks at intersections with stop signs or traffic signals, unless a school crossing guard is present. Read more about what you and your family need to know about pedestrian crossing safety. It is up to cyclists, drivers and pedestrians to keep everyone safe on Ontario roads. Learn more about how to stay safe as a pedestrian and as a cyclist or driver. Watch for children. Cycle or drive slowly and cautiously through school zones, residential areas, or any other area where children could be walking or playing. Watch out for Community Safety Zone signs that indicate areas where there is a special risk to pedestrians. Cycle or drive carefully near streetcar stops with islands or zones for passengers getting on and off. Pass them at reasonable speeds, and always be ready in case pedestrians make sudden or unexpected moves. Cross at the start of a green light. Don’t cross once the “Don’t Walk” signal starts to flash or the light turns yellow. Drivers will be fined $150 to $500 and 3 demerit points for offences at pedestrian crossings, school crossings and at crosswalks where there are traffic signals. The maximum fine for running a red light – a practice that puts pedestrians at risk – is $200 to $1000. So in summary, drivers and cyclists must wait until pedestrians have completely crossed the road!